Cali Inina Fejeran has a lot to celebrate. She turned 9 this month, became the youngest member to sign the Hafa Adai Pledge, and is the host of her own cooking show called “Guinaiyan Mama’Tinas” (The Love of Cooking). 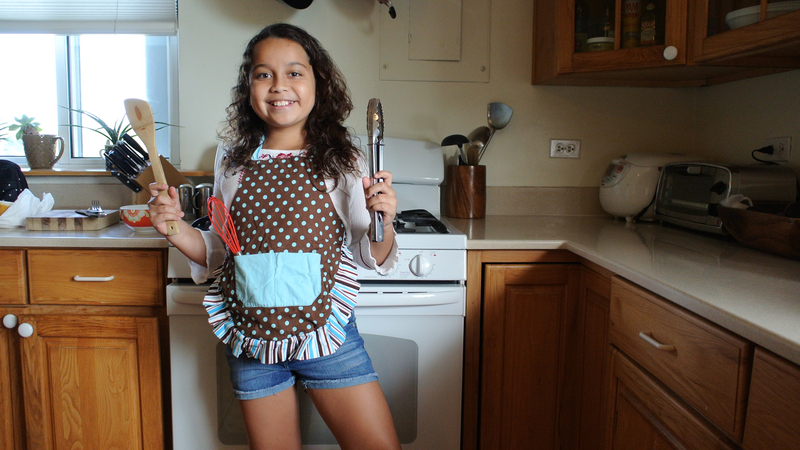 In Guinaiyan Mama’Tinas, this bright young girl teaches viewers how to cook some of her favorite dishes from scratch. Viewers can also learn a bit of the Chamorro language because Cali speaks only Chamorro on her show. The show is subtitled in English. “It’s easy to speak Chamorro,” said Cali, who has been studying the language at Hurao Academy for the past two years. “Sometimes the big words are challenging but that’s when my mom and dad help me,” she added. The eldest daughter of Lenny and Pika Fejeran says her father started teaching her how to cook when she was 7 years old, and that she enjoys experimenting in the kitchen with her nana (grandmother). The Fejeran family owns Pika’s Café, one of the island’s popular family restaurants. Guinayan Mama’Tinas airs on KUAM, with new episodes debuting once a month. Past episodes are online at KUAM’s YouTube channel. If you’re new or visiting Guam, Cali recommends you try a plate of barbecue chicken and red rice, as well as titiyas and banana bread. She also thinks you’ll have fun visiting Chamorro Village, the beach, the mall, and Pika’s Café.